Get Set as the next big exciting event for Venturer Scouts is on its way. 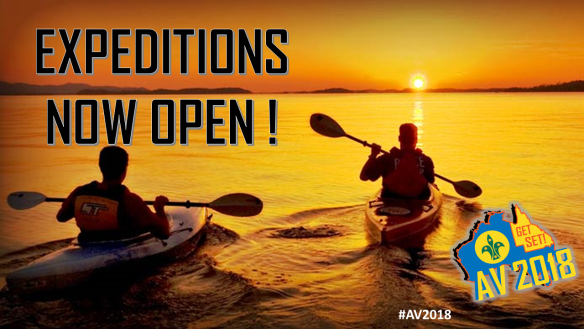 From the 2nd – 13th January of 2018 Queensland will host the 17th Australian Venture “AV2018”. The Venture is being held in Brisbane at Camp Warrawee at Joyner around 40 mins north of the Brisbane CBD. .The site is purpose built activity site and includes such facilities as a Dining Hall, Recreation Hall, Pool, Local Access to Creek, plus a beautiful lush surrounding for camping. The campsite is approximately, 90 mins from the Gold Coast Theme Parks, 40 mins from the Brisbane CBD, 40 Mins from Australia Zoo and 35 mins from the Brisbane Domestic and International Airport. Start saving and fundraising now as AV2018 is going to give you one of the best summers of your life. Regularly check back to keep up to date with all the latest news and information or contact your Leader for Venturer Scouts. The Venture is open to all registered Venturer Scouts from 14 and who do not have their 18th birthday prior the 2nd of January 2018. If you’re 18 years or older at the time of cut off, never fear as you can attend as a Unit or Service Leader. To be eligible to attend AV2018, Venturer Scouts need to be registered with their Branch, and to have earned the Venturing Skills Award or equivalent. Venturer Scouts, Leaders and Rover Scouts must attend the event as part of their state Contingent. * Expeditions will range from $300 to $1,000 depending on the expedition you choose. This activity will take you to Bounce for some intense trampolining, to Urban Climb where you can throw yourself onto some of the best indoor rock climbing walls Brisbane has to offer, and to Ice Skating to enjoy the cooler side of life on a large artificial Ice Rink. Ever wanted to shoot your best friend? This is the offsite activity for you then, you terrible person. You’ll get to engage with archery, catapulting and paintball skills (15+ only). This is a simple day at the beach. Hang out at the base with Beach Cricket and Beach Volleyball, or explore the beautiful Sunshine Coast at your leisure. We’ll be smack bang in the middle of the beach, river and surf, with easy transport options further afield and no set schedule. Find out what it’s really like to be a Banana-Bending Queenslander. Who says Brisbane doesn’t have culture? We may be Australia’s biggest country town, but that doesn’t mean we don’t get great shows occasionally. Take in a matinee and spend the rest of the day amusing yourself in Brisbane City. Ever seen a shark and thought to yourself – ‘I sort of want to give it a hug?’ Got you, fam. This is an activity at Underwater World, Mooloolabah; you will experience the Shark Dive Extreme, wherein you will be (professionally) thrown into a tank filled with (presumably) very nice killing machines. You haven’t been to Queensland until you’ve been to the Gem’s of the Gold Coast, Dreamworld and White Water World. Get your adrenalin pumping and take in all it has to offer. Before the electric engine, there was the internal combustion engine. Before the internal combustion engine, there was the… Horse. Get back to your roots with the original conveyance of choice for your middle-aged teens. Open to all experience levels, our professional provider will take you on an all-day ride around their Ocean View property, with a stop in the middle for lunch and a bit of a lake-side dip. Are you the sort of person that suffers from a terrible abundance of energy? The rest of the activities look too easy? We have you sorted with this triathlon of sorts: Mountain Bike ride down Mt Coot-tha, Canoe from Indooroopilly to Kangaroo Point and Rock Climb the Kangaroo Point Cliffs. Do you feel a need for speed? Well, we can’t unleash you on grown up cars just yet, but we’ve organised the next best thing – take part in a day of Go Karting, arranged just like a Bathurst race. In teams of 5, you’ll get a professional driver briefing and practice laps before being thrown into a full-on race against the other teams, featuring points, penalties, pit stops, lap counts and over a 100km of racing (16+ Only). Explore Queensland’s second-most-famous sand island with this Moreton Island Day Tour: you’ll not only see the sights in a convoy of highly-capable off road vehicles, but you’ll get to throw yourself off sand dunes and snorkel around the beautiful bay to boot. Want to get started on your future career as a pro-surfer, but don’t actually have any idea how? This is for you. You’ll learn how to body board and get some time on stand up boards over a three hour session. This activity runs concurrently with Get Burnt, and you’ll have plenty of time either side to explore the Sunshine Coast at your own pace. Ever met a Rover and thought to yourself, ‘Yeah, I’d trust them with my life?’ That’s… very trusting of you. Put your money where your internalised thoughts are with this whole day off-roading expedition presented by the Rover Section of Scouts QLD. We absolutely promise we aren’t just taking you out to the bush to murder you horribly. See the famous Glasshouse Mountains up close and personal, and with maximum effort, with this morning hike up Mount Beerwah (subject to change depending on weather). After you’ve gone up and back again, you’ll be joining the slightly lazier ones on Get Burnt to relax for the rest of the day at the beautiful Sunshine Coast. Need a break from all the venturing? Enjoy this relaxed, self-led day in Brisbane City Suggested activities include lunch, City Cat ride, Science Centre, but it’s all up to you – we’ll just get you there and home. Get your power-boat and personal water craft license (jet ski) with this full day, practical focussed course from our professional providers. Usually transferrable to other states. Want to harness nature for your own nefarious ends, or at least to get from here to over there? Learn to Sail, just like they did in the olden times. And also now. Capture the wind and embark on a course that will surely culminate in you eventually winning the Sydney-toHobart yacht race. For which we will take full credit.